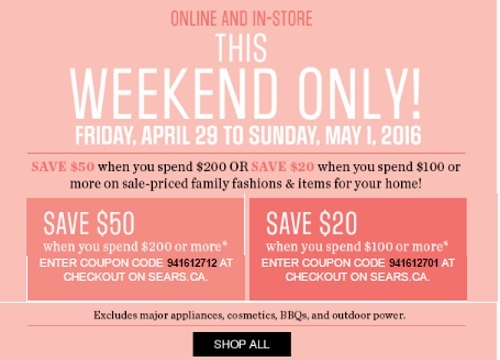 Sears has some great exclusive promo codes that they sent out to their email subscribers this weekend! Save up to $50 off our purchase with the promo codes below! Save $20 off when you spend $100 or more, with the promo code 941612701 at checkout. Offer ends Sunday, May 1, 2016. Excludes major appliances, cosmetics, bbqs and outdoor power.